We will be the leader in the mortuary cosmetic industry by exceeding funeral directors’ expectations and the expectations of the families they serve. 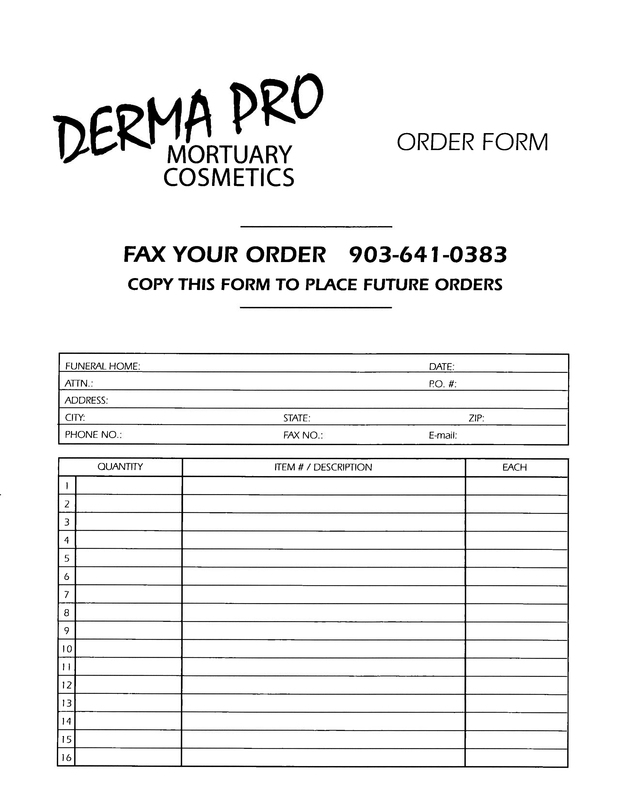 Thank you for your interest in Derma-Pro Mortuary Cosmetics, truly the finest and easiest to use of any professional cosmetic line available today. Developed for the funeral profession by funeral professionals, our products are easy to apply with a minimum of different colors to use, eliminating a shelf full of unwanted, unneeded cosmetics. Mortuary cosmetics are our only business, not a side line or accommodation product. We use only the finest ingredients available to formulate our products. The Derma-Pro line of professional cosmetics has everything you need to achieve professional results from the natural ‘no makeup’ look (translucent), to the most difficult cases that require covering cremes (opaques), without the heavily made up pancake look. Our products may be purchased in kit form (everything you need pre-packaged and ready to use, no mixing or blending required, cleans up with soap and water) or by individual item, priced for easy reorder and fill in or trial applications. We also offer a complete line of fine brushes and applicators. Specialty kits for Black, Hispanic, Oriental and Caucasian application are now available to funeral homes and licensed morticians. Technical assistance and support is available 24 hours a day by calling the Derma-Pro Assist Line at 1-800-531-9744. M.S.D.S. pages are supplied with each order, for every product. Although most of our products contain no hazardous ingredients. M.S.D.S. is still sent with every order to assure your firm is in compliance with state and local agencies. We are so confident that you will like the results that you can achieve by using Derma-Pro Mortuary Cosmetics that we offer a full money-back guarantee. If you are not fully satisfied simply return any unused products for a full refund. For more information, or to place our order for the finest professional cosmetics today, call 1-800-531-9744.